I consider it my good fortune to be here today to inaugurate the new hospital building of Jagadguru Sri Shiva-rathreeshwara (JSS) Maha-vidya-peetha. The JSS Maha-vidya-peetha was set up in 1954 by Dr. Sri Shivarathri Rajendra Mahaswamiji of the Jagadguru Veera Simhasana Peetha of Suttur, a revered one thousand-year old peetha. Religious leaders have for long recognized that people’s spiritual well-being cannot be entirely separated from their temporal concerns. It is only a few organizations that have put this thinking into practice. The JSS Maha-vidya-peetha and the Suttur Math are notable examples. They have established high traditions of selfless service to humanity. They have constantly fought for the attainment of social rights. They have taken several noteworthy initiatives in education, healthcare, shelter, food, skill training, rural development and social reforms. I congratulate the JSS Maha-vidya-peetha for opening this new hospital building aimed at providing affordable and quality healthcare in the region. 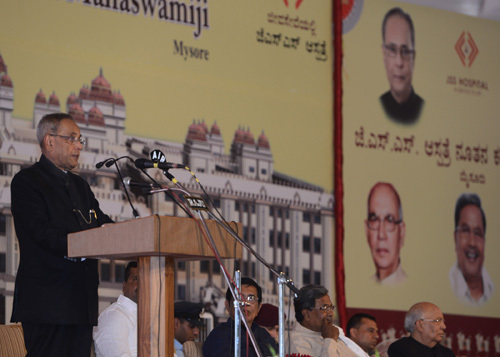 Karnataka is a pioneer in comprehensive public health services. Even before primary health centers were conceived in the country, this State had established a number of primary healthcare units, and a delivery system comprising curative, preventive and rehabilitation healthcare. These efforts have enhanced the health status, increased productivity, and raised living standards of the citizens in this State. Philanthropic causes like JSS Maha-vidya-peetha have also contributed in a large measure to this success. Health is an individual’s most primary possession. It is a valuable asset irrespective of the strata one belongs to. Mahatma Gandhi had said and I quote: "It is health that is real wealth and not pieces of gold and silver” (unquote). The health of a country’s population defines the state of development. A healthy population holds greater capacity to access opportunities for education, knowledge and employment. A robust healthcare system depends on the trinity of availability, quality and affordability. In 2005, the National Rural Health Mission was started to take healthcare to the doorstep of the rural population through a network of sub-centres, primary health centres and community health centres. Better infrastructure, trained manpower and effective drugs and modern equipments under this Mission have resulted in improved service delivery. A new National Health Mission, combining rural and urban areas, has commenced this year. Despite the best efforts made, there are areas that call for attention. Greater intervention is required to give the people a world class healthcare system. The public sector health service in India is still limited by its reach. Quality of healthcare delivery is also found wanting. Many people depend on the private sector for health services. They often fail to shoulder the burden of expensive medical treatment and plunge into poverty. People require the means to access specialty medical treatment and not stand denied due to high costs. Technology has to be harnessed in healthcare to increase access to quality medical treatment. It is heartening to note that the telemedicine project, using satellite technology, has connected remote health centres with super specialty hospitals in urban areas. This has helped expert healthcare consultation to reach the needy and under-served people. Other innovative uses of technology have to be explored. Effective and inexpensive cure for many diseases has to be found. Sophisticated equipments for medical procedures that are presently imported have to be manufactured indigenously. Research centres and medical colleges have to be encouraged for innovations. To have a large pool of high-calibre doctors in our country, medical education has to be strengthened. Our doctors have to be provided exposure to latest advances in their fields of specialization. Studies have indicated that investments in preventive public health are both pro-poor and pro-growth. Our health coverage strategy has to look beyond medical cure and intervention. Preventive healthcare has to assume importance due to the increasing trend of lifestyle diseases. Our health system has to gear itself to treat people and also provide guidance about prevention of medical conditions. A ‘healthy India’ is possible. For that, disease prevention, early detection and treatment have to be encouraged. A healthy living has to be fostered. Balanced diet, physical activity, lifestyle management and environment care have to be promoted to achieve well-being of mind and body. For ushering in healthy behaviour and practices, efforts have to be directed at change, in both individuals and communities. There is a need to increase our spending in the health sector. Public expenditure on health in India is 1.2 per cent of GDP. This is much lower than the 4 per cent plus levels in countries like US, UK, Australia, Norway and Brazil. A question raised by some today is whether India can afford to invest in order to ensure universal health coverage, or basic education, food security and employment guarantee. Let me attempt an answer by recalling what Derek Bok, lawyer, educator and former President of the Harvard University had said. I quote: "If you think education is expensive, try ignorance” (unquote). If we want our nation to progress; to be counted as one of the advanced countries in the world, we have to build our soft power. We can traverse the road ahead only if we invest adequately in our population. We have to enhance people’s capabilities by ensuring health and nutritional security, providing quality education and ensuring a decent standard of life. The right question is to ask whether India can afford not to invest in ensuring these basic constituents of living. The answer is no if we want peace, stability and prosperity. As public resources have several pressing uses, private healthcare providers have to be encouraged and suitably engaged to provide quality healthcare services. A serious thought that engages the attention of many today is the kind of health system that our country should possess - a fully commercial system driven by profits or a one responsive to our socio-economic conditions. Medical institutions like yours have a pivotal role to guide our health sector. You have a duty to build in the minds of the young doctors and health professionals a strong sense of patriotism and social responsibility. There are doctors who want to undergo higher studies in premier institutions abroad to acquire greater expertise and widen their horizon. They deserve encouragement. At the same time, they have to remember that the nation has invested in their education. Wherever they go, they have to retain the sacred bond with their motherland. The medical fraternity has to respect the good faith and trust that people have bestowed upon them. Doctors have to remember always the true meaning of the Hippocratic Oath that they took on entering this noble profession. I am most certain that a virtuous organization like the JSS Maha-vidya-peetha would continue to infuse the notions of ethical behaviour in their doctors and students. I once again congratulate the Suttur Math and JSS Maha-vidya-peetha for their selfless efforts. I wish them all success.